PORTLAND, Maine -- A $460 million settlement fund for victims of the Lac-Megantic oil train disaster in Canada is fully funded, keeping the process on track for the first payments to victims early in the new year. Robert Keach, the court-appointed bankruptcy trustee in Portland, Maine, announced this week that the settlement is being wired to a wrongful-death trustee and to the Canadian monitor, Richter Group. About $114 million will be used to settle wrongful-death claims, and Keach says the wrongful-death trustee will begin distributing those cheques "as soon as possible." Distribution of the remainder to other victims will proceed as well. 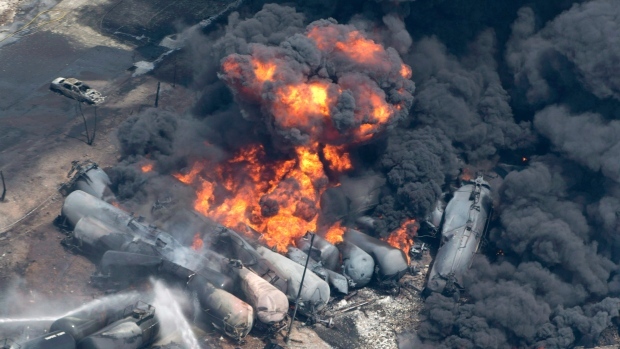 The disaster was caused when a runaway train with 72 oil tankers derailed in July 2013, in Lac-Megantic, Quebec, killing 47 people and causing raging fires.